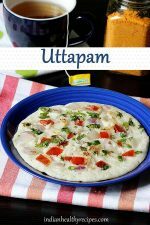 Uttapam recipe with step by step pictures. 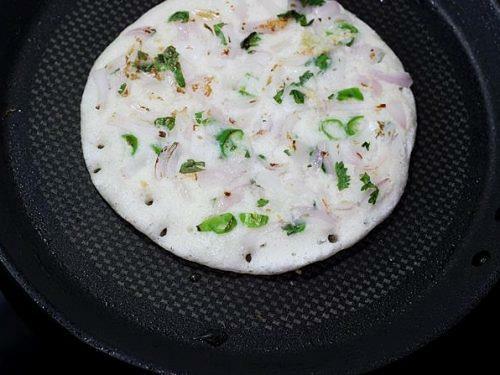 Uttapam are South Indian Breakfast pancakes that are most often made with Dosa batter. The fermented lentil and rice batter helps them to turn fluffy. 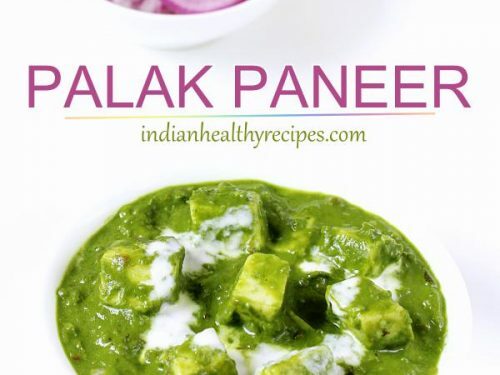 Different toppings like onions, tomatoes, carrots, green chilies, coriander leaves are used. Uttapam are crisp on the bottom with soft fluffy texture on top. The slightly roasted veggies compliment them with a nice aroma. 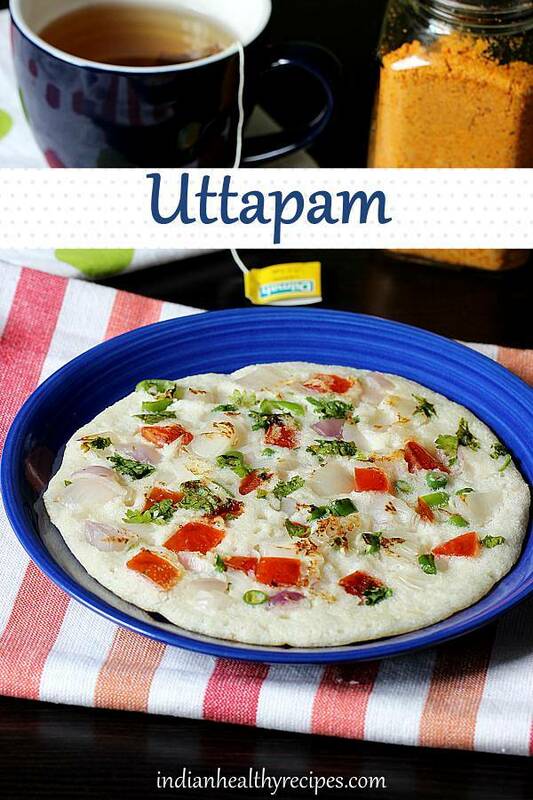 Uttapam are one of the most eaten South Indian foods for breakfast or snack. Traditionally they were made with slightly sour batter that is left over after making dosa on the previous days. The vegetable toppings balance the sourness of the batter and tastes good. 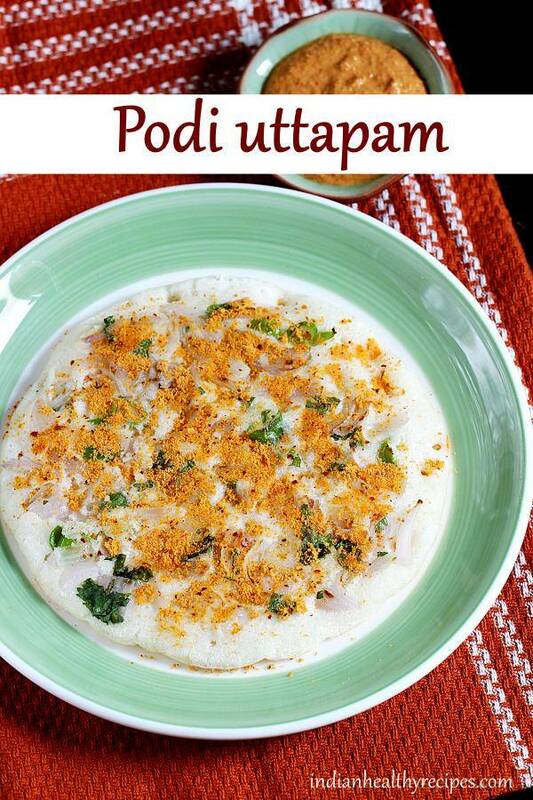 Uttapam is served with Chutney or Sambar. 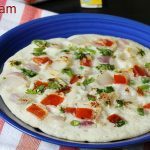 Uttapam is a South Indian breakfast made with fermented lentil & rice batter. 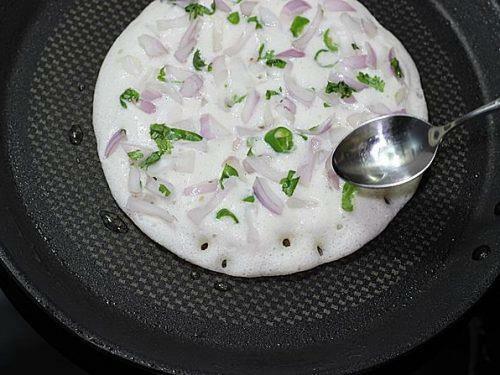 These pancakes are known as uttapam. They can be made with different toppings. Uttapam are served with chutney, pickle or podi. Wash and chop the veggies needs. Also finely chop coriander leaves. 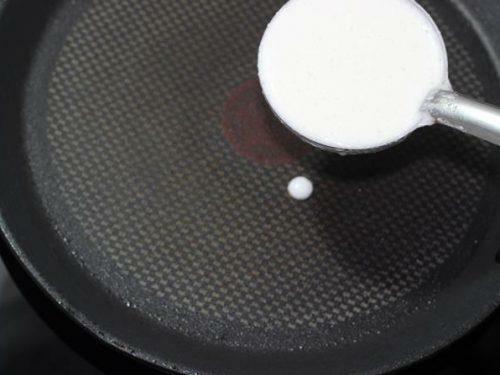 Grease a griddle pan or tawa. Heat it well. 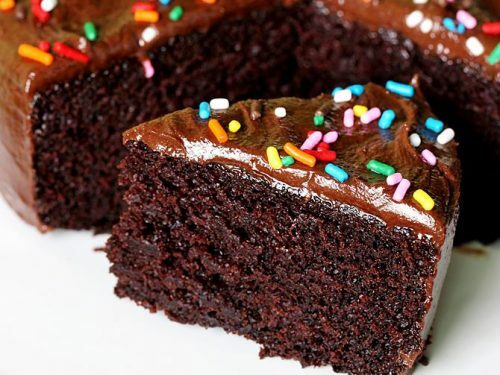 Bring the batter to consistency by adding little water if very thick. Check the salt and add a bit more as we are using the veggies. Pour the batter on the hot pan. If needed spread very little. Lower the heat and sprinkle the toppings. Sprinkle oil towards the edges and over the onions. When the base is firm, flip it and cook on the other side until it is cooked well. Cook on a medium flame. Cook the toppings as desired. Set aside and make the next one. 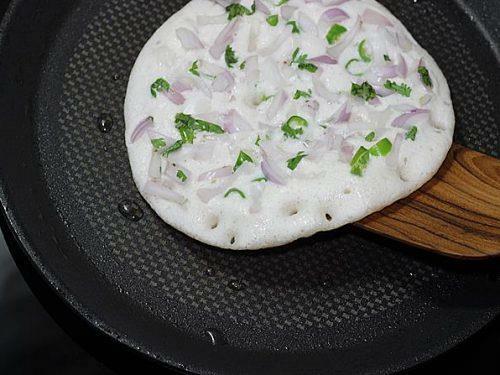 Serve onion uttapam with chutney or sambar or sprinkle podi. 1. 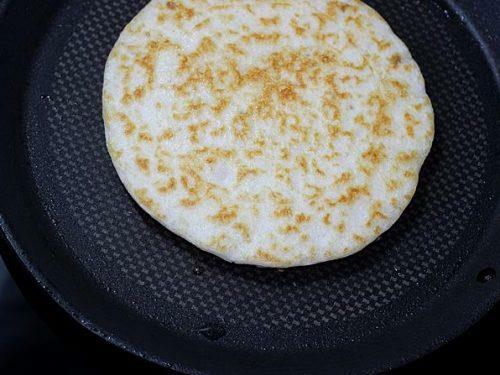 Uttapam is mostly made with leftover batter from the previous days, so I am not giving the step by step instructions on how to make the batter. You can find the link to dosa batter recipe in the recipe card below. You can also use this masala dosa recipe. We are using the left over or ready slightly sour batter. However you can also make with fresh fermented batter. The consistency of the batter must be same as that of dosa. You can add water to bring it to the consistency. 2. Keep the veggies ready for topping. 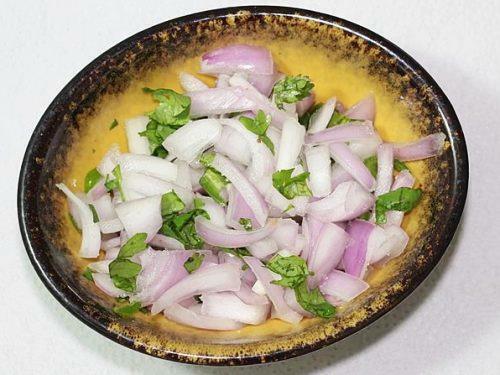 You can use onions, deseeded firm and ripe tomatoes, grated carrots, chopped green chili and coriander leaves. 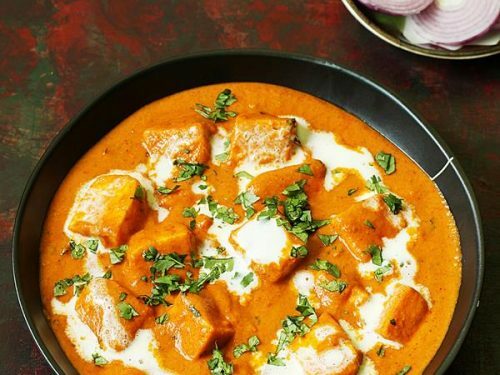 Please note that using tomatoes may make the uttapam more sour. In the step by step pics i have not used tomatoes. What you see in the first picture was made sometime ago when the batter was not sour. Add very little salt to the topping and mix. 3. Grease your tawa well. 4. When it is hot enough, pour a ladle full of batter. 5. 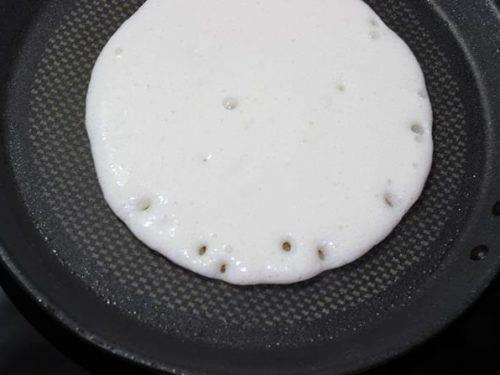 Do not spread the batter too much, uthappam has to be made thick. 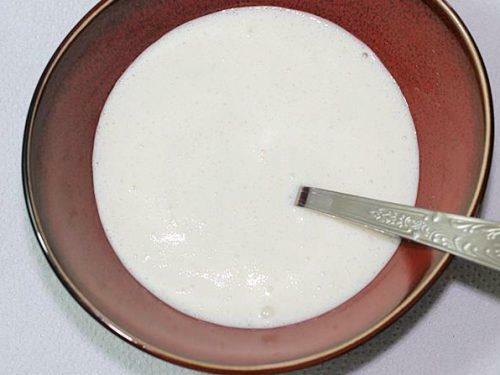 If the batter doesn’t spread on its own, then you may lightly spread a bit. 7. Sprinkle toppings as desired. Add oil around the edges and allow to cook on a low flame until the base cooks well and firms up. 8. Sprinkle little oil over the onions and flip it. 9. Cook until the onions are done. The color of the uthappam depends on the ratio of ingredients used for batter & the temperature of the batter. Usually batter straight away from fridge does not yield golden uthappam. 10. Make sure it is cooked well from inside. 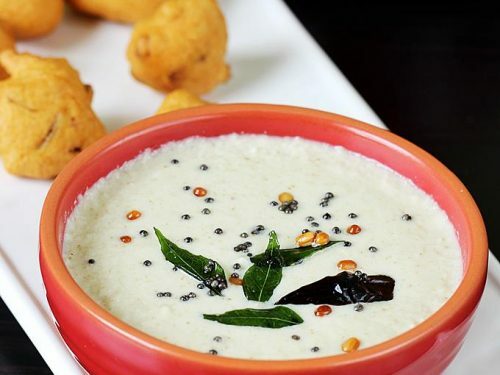 Serve with chutney or Tiffin sambar. You can also sprinkle podi and enjoy. 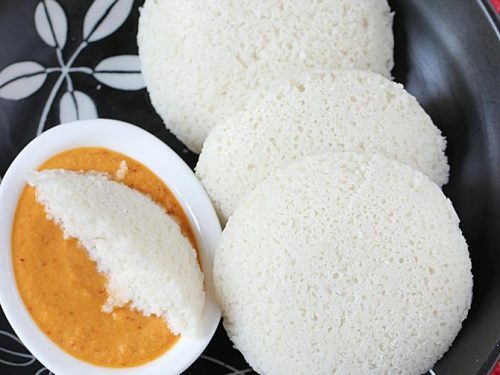 I used Idli podi. I like your recipes and presentation. Yes you must have over pulsed them. This may not be the right place to ask my question. Generally, what should I add in my daughter’s diet on a daily basis to boost her immunity?. I am a non vegetarian and my girl is 3 yrs old. I have just bought manna health mix powder. Will that help?. Please advise. My daughter actually hates the colour of RAgi malt. So, I make a RAgi and oats porridge with Apple. That’s something she likes to it. 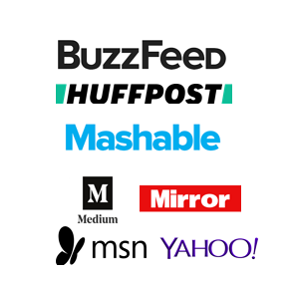 Is there a recipe for multigrain porridge powder on your blog?. Search did not return any results…. 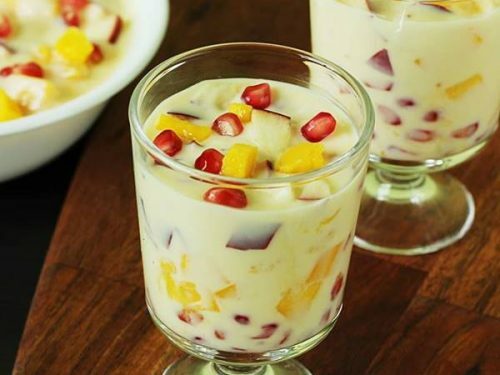 Firstly regarding the almond milk, there is one badam milk recipe for babies on the blog. I suggest you follow that and not the powder one. I feel the milk made with soaked almonds is really great for the body for building immunity. You will have to soak the almonds for 4 to 6 hours and then blend and cook with milk. Thanks a lot Swathi. I will definitely try out your suggestions on making multigrain porridge for my kid. It’s a little difficult to get the flours in this part of the world. And, I am afraid that I might break my mixer blades if I try to make the powders at home. Let me still give it a try by making in small quantities. So normally, the flours that can be considered are – RAgi, green gram, urad dal, rice, wheat, oats and dry fruits (almonds, cashews, walnuts and pistachios). Will these be good enough?.